Ellis Johnson, one of the most honored athletes in Kentucky history, died Sunday at the Veterans Affairs Medical Center in Huntington, W.Va., after a long illness. Mr. Johnson, who lived in Huntington, was 79. Mr. Johnson, a former head basketball coach at Marshall University and Morehead State Teachers College, was one of the few University of Kentucky Wildcats to letter in four sports -- basketball, football, baseball and track -- and the first to do so in the same year. 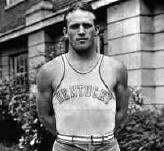 In 1933 he became UK basketball coach Adolph Rupp's first All-American. 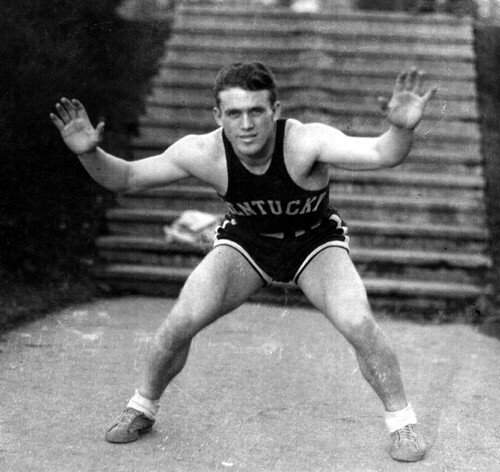 Mr. Johnson led the Wildcats to the first of four national championships under Rupp. Mr. Johnson was a charter member of the Kentucky Sports Hall of Fame. He also was the first person to be inducted into the Ashland Sports Hall of Fame. At Ashland High School, Mr. Johnson was the quarterback of three undefeated football teams, which won or shared the state championship. 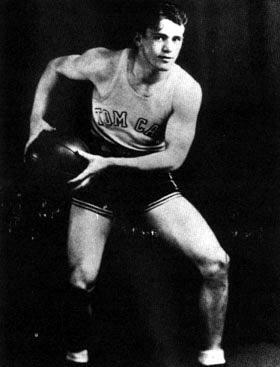 He led an unbeaten Ashland basketball team to the championship of a national tournament in 1928. Also while in high school he once played 25 consecutive basketball games without making a personal foul. He was twice an All-American in basketball and was All-State in both sports. Although he was best known for his ability in basketball, baseball was his favorite sport. He once had been an infielder in the minor leagues, but a collarbone injury sustained playing football forced him to give up baseball. Mr. Johnson began his coaching career at Williamson, W.Va., High School. In his year there, his team had a 28-2 record. He went on to spend a year as an assistant at Ashland, then went to Morehead. At Morehead, Mr. Johnson coached basketball, football, baseball and track and was director of physical education between 1936 and 1953. But he stood out in basketball, coaching nine All-Americans. He still is Morehead's all-time winningest coach in football, with a 54-44-10 mark, and in basketball, where his teams went 176-158. Morehead named its basketball arena after Mr. Johnson, and the winner of the Morehead-Marshall basketball game each year receives the Ellis Johnson Trophy. Mr. Johnson's career at Morehead was interrupted during World War II by a hitch in the Navy as a lieutenant. He played baseball and football during his Navy stint. A knee injury stopped him from playing football, and he was named coach of the Iowa Preflight station baseball team. Mr. Johnson retired from coaching in 1953 and went into the insurance business. He came out of coaching retirement to head the Marshall team in 1963 and retired from coaching again in 1969. Later, he was involved in cable television promotion in Huntington. Mr. Johnson, who was born in Morehead and grew up in Ashland, had been confined to a wheelchair for several years after having a stroke. Surviving are his wife, Myrtle McCoy Johnson; a son, Kenn Johnson of Mount Sterling; a daughter, Barbara Kennedy of Pensacola, Fla.; a brother; a sister; and five grandchildren. Services will be at 1 p.m. Thursday at Johnson Memorial United Methodist Church in Huntington. Visitation will be from 5 to 8 p.m. Wednesday at Klingel-Carpenter Mortuary in Huntington. Contributions are suggested to Johnson Memorial United Methodist Church in Huntington; Marshall University Big Green Scholarship Fund, P.O. Box 1360, Huntington, W.Va. 25715; or the Morehead State University Athletic Department Scholarship Fund. The obituary of Ellis Johnson in yesterday's Herald-Leader contained incorrect information. Although Johnson was an All-American while playing for University of Kentucky coach Adolph Rupp, he was not Rupp's first All- American. Also, Johnson did not play on any of UK's five NCAA championship teams. 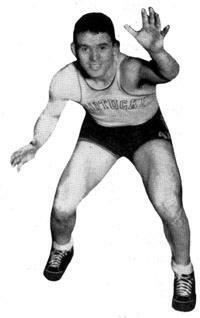 All-American Ellis Johnson: 1911-1990, The Cats Pause Yearbook Vol. 11 (1990-91) by Russell Rice, pp. 164-165. The passing of Ellis Johnson in early August at the age of 79 in Huntington, W. Va., closed another chapter in the rich tradition of versatile athletes who starred on both the high school and collegiate levels in Kentucky and then went on to great post-college playing and/or coaching careers. 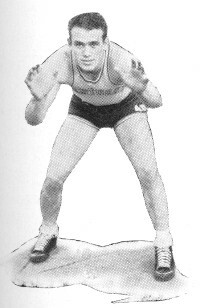 Recognized as one of the most honored athletes in Kentucky history, Johnson was an all-sports star at Ashland High School, and one of the few University of Kentucky Wildcats to letter in four sports - basketball, football, baseball and track - and the first to do so in the same year. In 1933, he became the first All-American to be coached by the legendary Adolph Rupp at Kentucky. A charter member of the Kentucky Sports Hall of Fame. he also was the first person to be inducted into the Ashland Sports Hall of Fame. He was quarterback of three undefeated football teams at Ashland, which won or shared a state championship. He was twice an All-American in basketball and was All-State in both sports. Johnson burst onto the Bluegrass basketball scene in 1928, when he led Ashland to a four-overtime victory over Carr Creek in the championship game of the Kentucky State High School Tournament. The best all-around athlete on the Ashland team, Johnson had never played in a losing football game and the Tomcat basketball team had won 44 straight games over a season and a half before losing to Portsmouth, Ohio. He and teammates Darrell Darby and Jack Phipps already had committed themselves to attend UK. 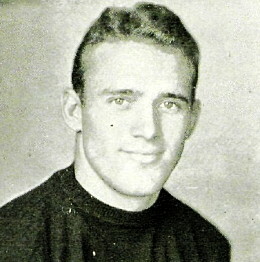 Gene Strother was bound for Ohio State. The State Tournament final was a promoter's dream: undefeated Carr Creek from an isolated, rural area; the Tomcats from the industrial northeast. "We were all looking forward to that tournament," Johnson recalled a half-century later. "It was always sorta like homecoming...an affair everybody wanted to see. And that particular one was something special. I'd heard it said that Carr Creek couldn't play, but they wouldn't let you play either, and that's just the way it seemed to me." The game was called the greatest defensive high school battle every fought in Alumni Gym. Carr Creek used a man-to-man attack that paralyzed Ashland's scoring territory, while the Tomcats retaliated with a zone that forced the Creekers to hurry their shots. Carr Creek led 2-0 at the end of the first quarter and 4-3 at halftime. The Creekers called their first time out of the season after Ashland went ahead 8-6 in the third quarter. Then they cut the maroin to 9-8 with 30 seconds remaining. Shelby Stamper made a free throw to send the game into the first of four overtimes. Neither team scored until the fourth overtime, when Ashland got the tip and Strother made a crip shot. The Tomcats again controlled the tip and worked the ball to Johnson, who twice "dribbled all over the floor" as time elapsed. "There was no 10-second rule then and you could also tip the ball and catch it yourself on the jump," Johnson recalled. "I had Zeida Hale guarding me the latter part of the game. I don't remember his foot being injured, but I would dribble around and let him tie me up, and then I'd get the tip, catch it myself, bring it down, pivot, dribble around some more, and let him tie me up, and then do it all over again. I was taller and could out-jump him. The clock was running all the time." UK was 50-8 during Johnson's three varsity season, winning the first SEC basketball championship in 1933, his senior year. Creek played in the national high school tournament in Chicago. The Creekers won two games before being eliminated by Vienna, Ga. Ashland won the tournament. Johnson, repeating as a prep All-American, was named captain of the National !nterscholastic Basketball All-American team chosen by sportswriters. Darby and Phipps were on the second team, Strother on the third team, Carr Creek's Stamper also placed on the first team. Johnson was playing freshman baseball at UK in the spring of 1930 when he was named a member of the athletics council, which was interviewing applicants for the head basketball coaching job vacated by Johnny Mauer. "I was still a freshman in the 1929-30 season," he said, "but here I was in the position of sitting in on interviews which eventually would decide who would be coaching me the next year. It was a weird situation, to say the least." The man chosen to succeed Mauer was Adolph Rupp, a successful young coach at Freeport (III.) High School, who also came to UK as an assisant football coach. Johnson had met Rupp, naturally, during the interview process. He met him again when Rupp returned to the campus in May, and had several conversations with him during football practices. The basketball Wildcats were well into their first practice sessions when they were joined after the annual Kentucky-Tennessee Thanksgiving Day football game by Johnson, Darby, Clarence Yates and team captain Carey Spicer, who was a two-time All-American under Mauer. Within a few days after joining the squad, Johnson moved into a starting guard position. His role was to play the back line and do most of the rebounding. Although only 6-0, he was a fine jumper who was adept at getting the ball off the board and making the long pass down the floor. "We got an awfully lot of birdies that way and the opposition didn't know what we were doing," he said. "We also scored a lot of easy points on several interceptions." Johnson had the honor of scoring the first points for a Rupp-coached UK team. After Georgetown captain Harry Lancaster scored the first two points of UK'S home opener, Yates tipped the jump-ball to Spicer, who hit Johnson sneaking down the back side for a crip. Those were the only points Johnson scored in the game. UK won 67-19. UK was 50-8 during Johnson's three varsity seasons, winning the first SEC basketball championship in 1933, his senior year. He was team captain, All-Conference and All-America that year. He also won three football letters as Wildcat teams on which he played were 14-10-2. He later played football for a wartime service team until an injury forced him out; then he coached the Iowa Preflight station baseball team. He began his basketball coaching career by compiling a 28-2 record at Williamson, W. Va., High School. He coached basketball, football, baseball and track and was director of physical education between 1936 and 1953, with time out for wartime service at Morehead, when he retired as its all-time winningest coach in football (54-44-10) and basketball (176-158). He came out of retirement in '63 to head the Marshall basketball team and retired from coaching again in '69. He later was involved in cable television promotion in Huntington. "Ellis Johnson was one of the best, if not the best, all-round athlete I ever coached," Rupp once said. "If he hadn't broken a collarbone in the minors, I feel he would have been a fine Major League baseball player. "It was quite an accomplishment for him to make All-American for me while earning letters in three other sports here at the university. We have remained friends all these years."